TaylorMade is a name I frequently associate with high-caliber golf performance. Aimed at the biggest-bang-for-the-buck buyer (like me), this 8-piece set (4 iron-PW, SW) provides maximum distance in an easy-to-hit iron due to its super-sized design and thin, fast face. Equipped with the RE-AX Super Fast graphite shaft in regular flex, this club seems to have all of the easy to play features many golfers are looking for. The r7 CGB MAX iron incorporates what TaylorMade calls "Inverted Core Technology" (ICT). This is a carryover breakthrough from their metalwood technology and is used to expand the size of the Co-Efficient of Restitution (COR) zone in TaylorMade drivers. ICT changes the way the clubface behaves at impact and increases the size of the zone that delivers high initial ball speed. 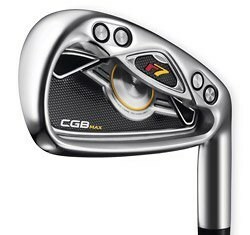 This helps make the r7 CGB MAX more forgiving than many other clubs in this category. The club face also features a 100% CNC-milled, high strength 455 stainless steel surface for maximum ball speed. With all of this game-improvement technology going on, there isn't much left to make the clubs workable -- but if you're in the mid-to-high handicap range, the other features will be more beneficial to you than any workability you might have. These are a good value in a solid game-improvement iron set and compare well with the TaylorMade r7 XD Irons or the TaylorMade r9 irons.